Shifrah Tobacman and I met as students in DLTI (the Davvenen Leadership Training Institute), a two-year training program in liturgical leadership offered at Elat Chayyim, the Jewish Renewal retreat center, at that time located in Accord NY and now part of the program of Camp Isabella Freedman in CT. Sometime after DLTI, I encountered her Omer poems for the first time. Shifrah’s Omer poems moved me the very first time I read them: not so much as poetry qua poetry, but as devotional exercises, as the expression of a soul yearning for greater connection with the divine. Counting the Omer—the 49 days between Pesach and Shavuot, between liberation and covenant—is a spiritual practice I’ve come to cherish. I love the way it sanctifies the passage of time. The kabbalistic interpretations of each week and each day in the journey offer lenses through which my springtime journey is reflected and refracted each year. From the day of chesed (lovingkindness) squared through the day of Shekhinah (immanent divine presence / Kingdom) squared, each day takes on its own spiritual tone. I love that Shifrah’s manuscript is intended to be used at both seasons, to help readers mindfully sanctify both of these journeys through Jewish sacred time. 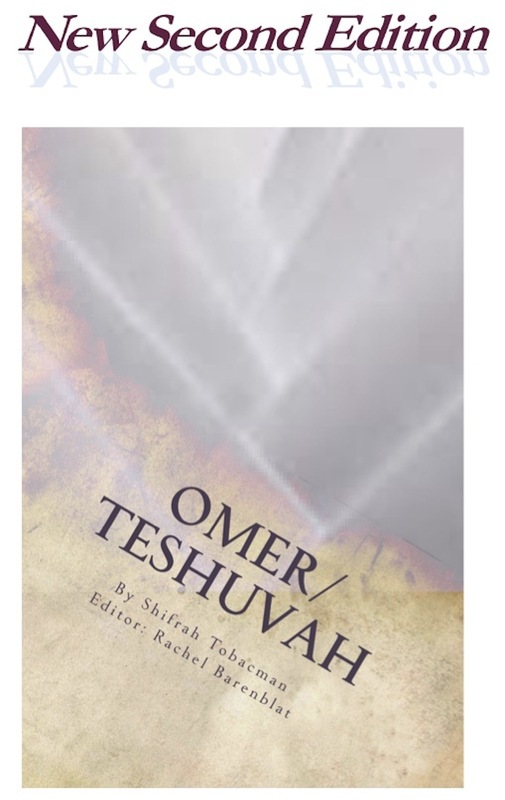 We had fun conceptualizing how the layout of this book might work so that it could be read front-to-back (Omer) or back-to-front (Omer Teshuvah.) Held one way, this is bound like an English-language book; held the other way, it’s bound like a Hebrew-language book. In this, the book manifests the dual identity with which so many Diaspora Jews are familiar. And, of course, there’s always the famous saying about Torah “Turn it and turn it, for everything is in it.” (Pirkei Avot 5:26) This book, too, is meant to be turned and re/turned. This book is rooted simultaneously in two worlds, the world of poetry and the world of prayer. Poetry and liturgy are, of course, close cousins; much of the classical Jewish liturgy takes poetic form. But the needs of a poem and the needs of a prayer aren’t always identical. The work in this manuscript is, I think, primarily aligned with the needs of prayer. Following in the footsteps of our mutual teacher Reb Zalman Schachter-Shalomi, Shifrah has written poems which are meant to be prayed. In the poem for Gate 39, Shifrah writes, “What do you use / to keep yourself connected / to God?” With these lines, and with so many others in this collection, she reminds me to enter spiritual practice wholly. “We use the tools at our disposal / to put the pieces back together,” begins the poem for Gate 41. May this collection help each of us to put our pieces back together, and to reassemble the shards of a creation which is always ready for repair.